That's right. This blog has moved to its new location: www.joshcleland.com. There won't be any more updates here. Go to my new blog. Go, now! That's where all the cool people are. Today I launch my redesigned website: www.clelandillustration.com! With it comes a new WordPress blog. It's time to say goodbye to Blogger.com. Blogger has been very good to me over the last couple of years, but it's time to move on to a more advanced blogging system, such as WordPress. What do I do if I'm subscribing to this blog?!!!! Don't worry. Tomorrow (Saturday, July 25, 2009) I will be transferring the feeds to my new blog, so hopefully you won't have to do anything. The feed should automatically transfer. If you are still worried, simply unsubscribe to this blog, and subscribe to the new blog after tomorrow. We'll get through this together if we stay together. I have faith in you. Hello, everyone. I've been hard at work developing my new website and blog. 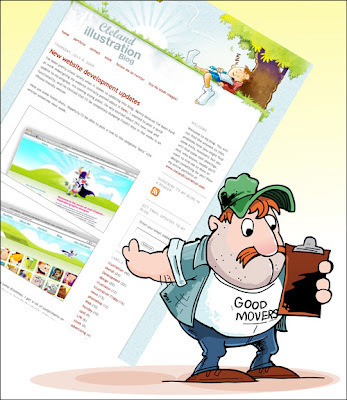 You can get a sneak peak at www.clelandillustration.com/test. There you can visit my new WordPress blog as well. I know what you're thinking: "But Josh, I'm subscribed to this blog. What do I do when you move???" Settle down. When the time comes I will provide with a 34-step instruction list that must be followed EXACTLY! Until then, sit back and relax. Worry about something less severe, like the economy. UPDATE 7/25/09: My website is now updated and can be viewed at www.clelandillustration.com. "The navigation is hard, and this is why." "It looks weird on my browser. I'm using Internet Explorer 6.0". Simply leave your comments on this post, or email me at Josh@clelandillustration.com. I thank you in advance. I've been pretty silent lately when it comes to updating this blog. Mainly because I've been hard at work redesigning my website (initially posted about it here). I wanted to post a quick update to my progress. It's coming along great. I'm very excited about this new look and functionality, and I'm thrilled that I'll be completely dumping Flash!! Also in the works is an iPhone-friendly version. Here are some tease shots. Hopefully I'll be able to post a link to the complete "beta" site version sometime next week. I will also be redesigning this blog. This presents some dilemmas. I get a lot of compliments on my current design, which I like. However, I need to have my blog fit the identity of the new site. So, I'll have to work that out. I'm also debating switching the blog over to Wordpress, although figuring out how to transfer all the feed info and stuff sounds like a headache. We'll see. I'll also have to figure out how to design a custom blog with WP (something I need to know anyways). So, stay tuned. As always you can keep up with the blog by subscribing via RSS, or signing up to receive updates via email. How fun is that!